After seeing thousands of cattle die in a Kansas blizzard in 1886, Charles "Buffalo" Jones, a co-founder of Garden City, Kansas, also worked to cross bison and cattle at a ranch near the future Grand Canyon National Park, with the hope the animals could survive the harsh winters. He called the result "cattalo" in 1888. Mossom Boyd of Bobcaygeon, Ontario first started the practice in Canada, publishing about some of his outcomes in the Journal of Heredity. After his death in 1914, the Canadian government continued experiments in crossbreeding up to 1964, with little success. For example, in 1936 the Canadian government had successfully cross-bred only 30 cattalos. Lawrence Boyd continues the crossbreeding work of his grandfather on a farm in Alberta. ↑ Porter, Valerie (2008). The Field Guide to Cattle. Voyageur Press. p. 70. ISBN 978-0-7603-3192-7. Retrieved 14 May 2015. ↑ Drew, K. R.; Baskin, L. M. (1989). Wildlife Production Systems: Economic Utilisation of Wild Ungulates. CUP Archive. p. 354. ISBN 978-0-521-34099-1. Retrieved 14 May 2015. ↑ Brower, Jennifer (2008). Lost Tracks: National Buffalo Park, 1909-1939. Athabasca University Press. pp. 132–133. ISBN 978-1-897425-10-7. Retrieved 14 May 2015. ↑ "Charles Jesse "Buffalo" Jones". Kshs.org. Retrieved 2009-10-02. ↑ "The Story of Cattalo". canadiangeographic.ca. May 2011. ↑ Boyd, M. M. (1914). "Crossing bison and cattle". J Hered (5: 189-197.). ↑ Magazines, Hearst (December 1934). "Cattle Developed for North are Part Buffalo". Popular Mechanics. Hearst Magazines. p. 863. ISSN 0032-4558. Retrieved 14 May 2015. ↑ "ABWR". ABWR. Archived from the original on 12 October 2009. Retrieved 2009-10-02. 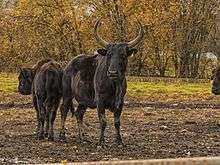 ↑ "American Beefalo Association". Retrieved 14 May 2015. ↑ "Strands of undesirable DNA roam with Buffalo, By Jim Robbins, 9th January 2007, The New York Times". Wildcattleconservation.org. Retrieved 2009-10-02. ↑ Polzhiehn, R.O. ; C. Strobeck; J. Sheraton & R. Beech (1995). "Bovine mtDNA Discovered in North American Bison Populations". Conservation Biology. 9 (6): 1638–43. JSTOR 2387208. ↑ "Halbert, N.D., Ward, T.J., Schnabel, R.D., Taylor, J.F and Derr, J.N. (2005) Conservation genomics: disequilibrium mapping of domestic cattle chromosomal segments in North American bison populations. Molecular Ecology (2005) 14, 2343–2362" (PDF). Animalgenomics.missouri.edu. 2009-02-12. Retrieved 2009-10-02. ↑ "Halbert, Natalie Dierschke (2003) The utilization of genetic markers to resolve modern management issues in historic bison populations: implications for species conservation Ph. D. Dissertation, Texas A&M University, December 2003" (PDF). Retrieved 2009-10-02. ↑ "Genetically Pure Bison Found in Utah". UPR Utah Public Ratio. 2015-12-16. Retrieved 2015-12-24. ↑ Catherine Brahic (October 15, 2008). "American icons aren't the animals they used to be". New Scientist. Retrieved 2015-01-07. ↑ "Code of Federal Regulations (9CFR352.1) rev 2004. — "Catalo or Cattalo means any hybrid animal with American bison appearance resulting from direct crossbreeding of American bison and cattle."". Access.gpo.gov. Archived from the original on August 26, 2009. Retrieved 2009-10-02.